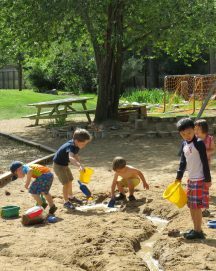 The Montessori program is designed to allow development at a child’s own pace. It provides for a wide range of developmental needs among students. Montessori teachers are child development specialists with training that enables them to present the curriculum in a manner that best fits each student, rather than making the student fit the curriculum. The Montessori curriculum is a sequential program designed for independent learning. Each year holds a special significance for the student. The younger child learns through observation of the older children. In addition, the older student becomes a leader and reinforces her knowledge as she helps younger friends. Helping others is a heritage of responsibility passed down year to year. From the moment a child enters Jarrow Montessori we are attentive to the ongoing development of the whole child: intellectual, physical, emotional and social. Occasionally the pre-primary level is incorrectly viewed only as preparation for kindergarten. Actually the entire three-year span is considered kindergarten. We stress that this cycle is completed upon approaching age six, not age five. 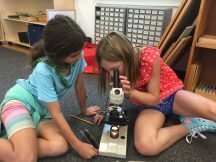 In the third year of the Montessori primary classroom there is an explosion of learning and intense working knowledge of the advanced materials. The five year old leads the class with dignity, self-esteem and self-confidence; three qualities which enable a child to approach new social challenges in life. If the child leaves before age six, he has not received the full benefit of our program nor has he had time to complete his cycle of learning in our curriculum. Long-term relationships allow a teacher to fully understand child and family.